Today’s party is at Gold Mountain golf club (7263 W. Belfair Valley Road, Bremerton, WA 98312 / ‪360.415.6895‬ or info@goldmt.com) It was a retirement party for Steve and Susan. Lena price and her team did an AWESOME job decorating the room, and organizing the entire event. The decorations are phenomenal. There are at least 10 banners hanging around the room of vintage cars that Steve restored. On the tables there are black-and-white checkered flag napkins, party favors, vintage car themed vases with flowers inside. There is also a VERY creative idea that says “Take a selfie, send a surprise party selfie to Steve and Susan’s cell phone” There is also a vintage model car on the table with a beautiful centerpiece. One word to describe this is “STUNNING”. Shirly DeFord is the photographer for the event. Shirly is always a breath of fresh air! She is fun, friendly, professional, cheerful and more! She always has a smile on her face. Trista Ortiz is the venue and catering manager. Trista is my MOST FAVORITE. She always makes sure that every event turns out AMAZING for the guest of honor and their guests. Later on the PrimaChord Quartet Firemen performed. They were VERY funny. There was a very talented face painter for the children in attendance, and a lot of dancing. An EXTREMELY fun party for sure. Gold mountain golf club welcomes site visits to ensure you have selected the perfect setting. 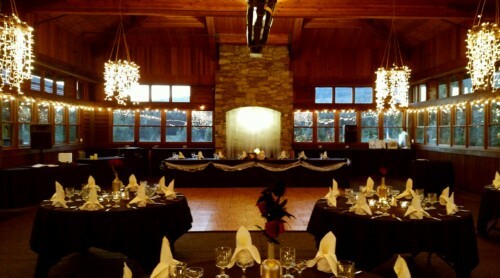 Your party may enjoy their terraced Olympic banquet room – an ideal setting for any occasion – or, perhaps, The Restaurant’s inviting main dining room and lounge. Take in the natural beauty and surroundings with an outdoor event on their patio beneath the stars. In addition, for business retreats and meetings, they offer the Cascade room, a private meeting room with amenities.